Returning to the Pacific Northwest yesterday from a three week surfing and fish taco eating getaway to sunny Sayulita, Mexico; I’m back with a post containing some very wintery food. The eating experiences I enjoyed in Sayulita will definitely inspire some future posts once ingredients become available. This was actually course number three of the previously mentioned epic dinner. I will continue to write about each course of that amazing meal over time, and in no particularly logical order whatsoever. This was a knockout dish, and one of the favourites of the night. It deserves to be accompanied by a big red, and should be the last served of the savoury dishes for obvious reasons. I must admit, I did deviate from my typical approach to steak for this dish by cooking in a temperature controlled water bath. The results are astounding in terms of the consistency of cook; it ensures a perfect result for a very expensive steak, which can be nerve racking when using conventional heating methods. Mix the salt and porcini powder, reserve half of the mixture. Coat the top and bottom of the steaks with the other half of the porcini-salt rub. Vacuum seal with the garlic clove and thyme, then cook in the sous vide bath at 56 degrees C for 3 hours for medium rare. Meanwhile, boil the celeriac in salted water until it can be easily pierced by a fork. Transfer to food processor and combine with the remaining ingredients. Blitz to a puree. Reduce red wine to a third over medium heat. Remove from heat and add peppercorns. Five minutes prior to servicing, re-heat, then add butter and swirl to incorporate. Now the sauce is ready to serve. Heat a cast iron pan to high and add a glug of olive oil to the pan. Remove the steaks from the sous vide bath and dry any moisture off with a paper towel. Re-coat with the porcini-salt rub, then sear steaks for 30 seconds to one minute per side. Careful not to sear too long, as the steaks are already cooked at this stage. We are just looking to caramelize and achieve a nice crust. To plate, place a dollop of the celeriac puree on one side of a plate. Using a spoon, spread the celeriac puree to form a tear drop shape. 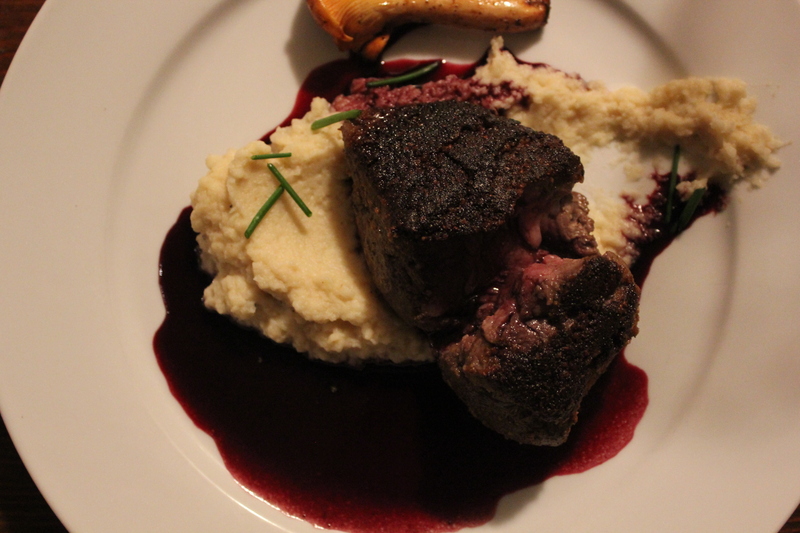 Pour the red wine reduction around the celeriac puree, and top with the steak. Garnish with a roasted wild mushroom, freshly picked chanterelles were used for this dish. Serve with an Okanagan Cabernet Franc, Cassini Cellars 2012 vintage would be a great choice!